As seen in the picture above, taken by Instagram user orbaygumus (via ifoAppleStore), the large cuboid structure is reminiscent of glass installations at flagship Apple Stores in New York and Shanghai. Unlike the others, however, the Turkish store will be one of the first to use gigantic panes of glass in what looks to be a seamless construction. The structure's almost transparent facade reflects off the still water and polished black stone walls of a surrounding shallow pond, while light is allowed to pass through into the store below. The only thing missing is a large Apple logo. Pictures of the Zorlu construction site showed up last week, but the five-sided glass installation was hidden by protective boarding. Apple is planning to implement curved monolithic glass elements at its upcoming Campus 2 headquarters and the company's relocated San Francisco flagship store design calls for massive two-story sliding glass doors. However, the Turkey Apple Store, at least for now, appears to use the largest glass components yet seen in an Apple build. Apple's latest store is set to open this weekend in Istanbul's Zorlu Center, a centrally-located multi-use space featuring a high-end shopping mall, performing arts center, hotel, office space and residential areas. According to reports in December, the outlet covers 21,500-square-feet of space, including the showroom floor, special event areas and dual Genius Bars. Zorlu will be the company's first physical retail presence in Turkey and comes five months after the Online Apple Store went live in the country last October. During a trip to Turkey in February, Apple CEO Tim Cook confirmed plans for the Zorlu outlet in a meeting with Turkish President Abdullah Gül that covered research and development operations and a proposed education technology initiative. At the time, Cook called the store "unique" and said it would feature a design concept seen nowhere else in the world. 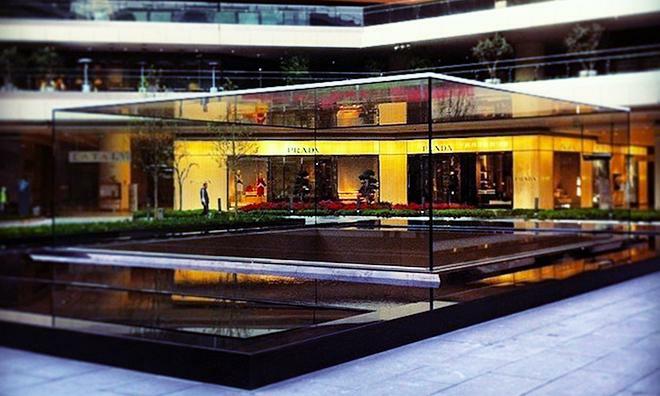 The Zorlu Center Apple Store is slated to open its doors on Saturday, Apr. 5, at 10 a.m. local time.